After saying, "Goodbye" to my WOW guild mates in Warrenton, mom and I headed north and then made a left to head west towards Ohio. She was the navigator. We picked up Interstate 70 and then 68 and drove through the "handle" of Maryland. As I hoped, we had wonderful views of the mountains. We take this Interstate system for granted and we gripe when there's construction on it. I know I did. The drive from Youngstown, Ohio west across Ohio on Tuesday was filled with sections of one-lane highway. "Oh geeze. Another section where there won't be anyone working but the road is down to one lane." But, it's an engineering marvel. Here the road snakes down the mountains and through a valley, eventually going back up the mountains on the other side. In Northeast Iowa, where I grew up, there are an abundance of 2 lane roads that seem to defy gravity as they wind through the forests and along the bluffs of the Mississippi River. The shortest distance from home A to fishing point B was usually along these. No shoulder and sometimes with a drop off. Our Interstate system allowed our economy to thrive in the 1960's. Goods could be moved extraordinarily fast. So could people. We passed over many of these 2 lane roads that snake up and around and over these mountains, true mountains, nothing like the bluffs I know. I cannot imagine how slowly goods would move without these highways. They make driving so much easier. I put on cruise control and pretty much just steered. I remembered driving west to take Carole to Reno. 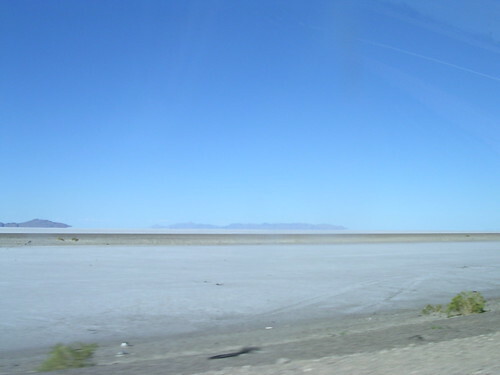 Interstate 80 crosses the Great Salt Desert west of Salt Lake City, Utah. The drive is straight, the land is flat and white. You can see mountains in the distance but space is relative here. Once you enter the desert, you really don't have a concept for how big it is. You drive and drive and drive. I tried to imagine how those first settlers felt when they decided to cross this and spent days or weeks slowly working their way across it. I'm given to understand that most roads were built along the paths of animals or the first settlers, Native Americans. There was still a great deal of hacking and slashing through underbrush but the road generally followed a trail carved out of the side of a mountain or stretched flat across a plain. 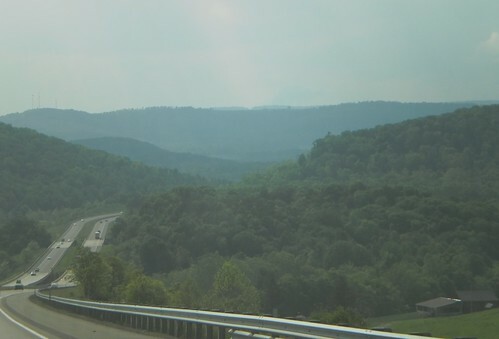 As we approached a rather impressive rock cut in western Maryland, I wondered if this area had been chosen because it was easier to blast this cut or if this had been the location of an earlier road. There is a visitor center here and a hiking trail that leads to the top of the hill for what the signs said was an "astounding view". 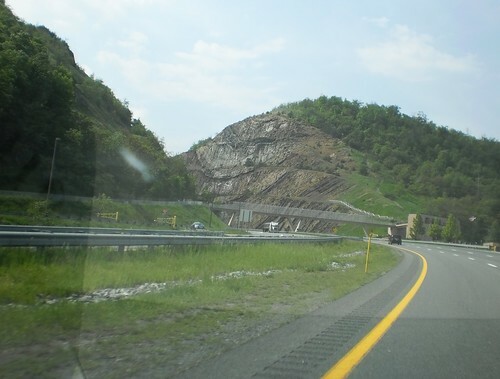 Later research reveals this is "Sideling Hill Cut". I-68 is called the "National Freeway" because it parallels a National Road built in the 1800's. Maybe some day I'll come back and actually climb this to judge whether there really is an "astounding view". 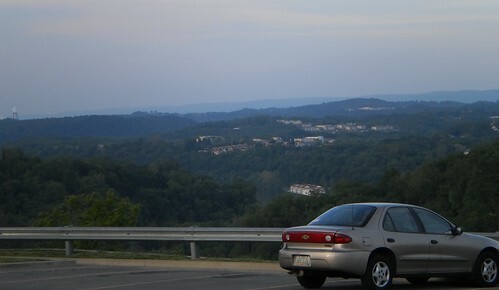 The road ended in Morgantown, West Virginia and this is where we stopped for the night. As it turned out, we were about 3 hours from April and Perry's and, had we given them some idea we were that close, might have pressed on. But we said we weren't going to be there until Monday so we stopped. There was a Cracker Barrel restaurant next to the hotel. Mom had never eaten there so that was supper. The view from the restaurant parking lot was impressive. It's things like this that make me happy to drive places instead of fly. You can see some of the country from the air. It's a great way to see the Rockies, for instance. Looking down on them, you think how few people have been to the top of that peak or walked around the small lake you can see. But the flavor of the land, the hills, the colors, are missing when you're not down on the ground, even driving through at 70 mph. Mom probably won't get to see these kinds of sights again so I'm glad I made the decision to change our route and drive the routes we did. She got to see and experience the Appalachian Mountains, something she'll always remember.